The merger of NetDimensions into PeopleFluent adds best-of-breed learning capability to award-winning integrated talent management (ITM) business. Award-winning LMS, NetDimensions, forms a product within new learning suite. Learning Technologies Group plc (“LTG”), the integrated talent management and learning technologies software and services provider, has announced the completion of a merger between PeopleFluent and NetDimensions. The joining of NetDimensions and PeopleFluent sees NetDimensions cease to operate as a separate business within LTG. NetDimensions has joined PeopleFluent’s talent management offerings to form a core part of a newly-created learning suite. The introduction of NetDimensions’ LMS to the PeopleFluent Learning suite provides improved services to customers, including enhanced global support to help customers at their point of need. NetDimensions, which was acquired by LTG in March 2017, is a leading provider of learning management solutions with a focus on delivering and verifying learning within high-consequence industries. 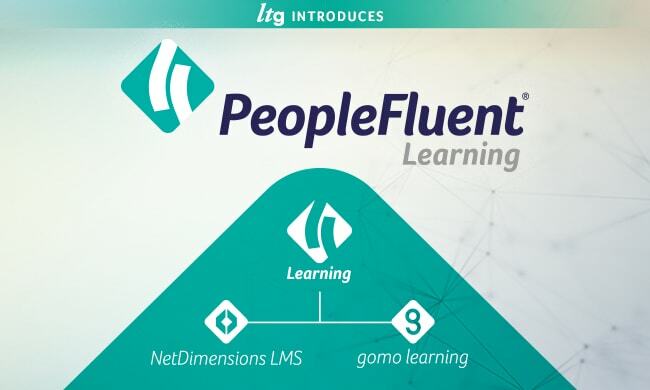 The integration of NetDimensions software into PeopleFluent’s learning offering forms a significant part of LTG’s focus on helping global companies attract, retain and develop their people. LTG’s businesses – LEO Learning, gomo, Eukleia, PRELOADED, Rustici Software and PeopleFluent – are at the forefront of innovation and best-practice in the learning technology sector, and have received numerous awards for their exceptional performance. Our portfolio of brands represents the best of breed and they are acknowledged throughout the industry as market leaders. Our Talent Productivity Platform unifies talent acquisition, talent management and learning into a single, collaborative experience that attracts the best candidates, helps managers make better decisions, and empowers employees to grow their careers. A part of Learning Technologies Group plc (LTG), PeopleFluent works with large and multinational organisations across 214 countries and territories, including 80% of the Fortune 100.